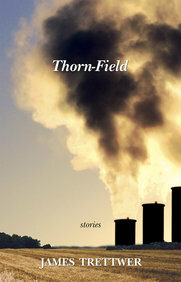 In James Trettwer's Thorn-Field, the denizens of Liverwood and its potash corporation are not unique but are living authentic lives. While the townspeople may be passed by with little more than a glance by those travelling on the highway, the microcosm of the town is pulsating with all the idiosyncrasies and peculiarities that make life both interesting and plausible. Under the shadow of the main employer, the potash mine - a place that can kill and leave orphans vulnerable, the corporation's tendrils are thick and invasive in the dreams of the young - the mine that pays for cardboard coffins and peoples' mortgages. As its four-rotor boring machines rumble deep under the earth, Liverwood's town and corporate office embrace their rhythm. The young and old, the fathers, mothers, sons, and daughters thread their way through the thorn-fields of their relationships which are complicated by addictions and obsessions, by cravings and suspicions, and by the desire to leave or stay.